As seen on TV, Thundershirt is an affordable, drug-free solution for anxiety problems in dogs. Thundershirt uses gentle, constant pressure on your pet's torso (just like a constant hug) to help calm your pet. Much in the same way that swaddling comforts newborn babies, Thundershirt comforts pets and eases anxiety. Thundershirt is great for dogs with fear of thunder or fireworks (or any loud noise), separation anxiety, travel anxiety, crate anxiety, grooming, barking problems, hyperactivity, leash pulling, and even as a general training tool. NOTE: For additional calming effect, ThunderEssence aromatherapy spray and drops are also available. Use for anxiety symptoms including: Panting, shaking, drooling, barking/whining, hiding, scratching, licking, bolting, eliminating indoors, seizures and more. Thundershirt uses pressure to relieve anxiety. Experts believe that pressure has a calming effect on the nervous system and have been using pressure techniques for years on both animals and humans. Like acupuncture and acupressure does for people, applying pressure to dogs has been proven to help calm them in stressful situations. In fact, 80% of dog owners who tried Thundershirt for a variety of anxiety problems noticed improvement in their dogs. Veterinarians and dog trainers use and recommend Thundershirt for anxiety, too. In severe cases of separation anxiety, it is recommended to use Thundershirt in conjunction with a training program. Thundershirt is designed to be safe to leave on for extended periods of time when appropriate for the situation or issue. When properly sized and properly put on with a comfortably snug fit, your dog should be very comfortable. If your dog will be wearing a Thundershirt for more than two hours at a time, it is recommended to remove Thundershirt every one to two hours during the initial periods to check for any signs of irritation points. Irritation points are very rare, but it is best to be cautious. For many anxieties, Thundershirt does not require any training of your dog to be an effective solution. Many dogs will exhibit reduced or eliminated symptoms with the very first usage of Thundershirt (e.g. eliminated shaking, reduced panting, etc.). Some dogs require three or four usages before they begin to show improvement. Before putting Thundershirt on your dog for the first time, offer a small food treat to your dog using the folded Thundershirt as a "plate". Dogs typically become more comfortable and trusting of something that "brings" them food or anything that they associate with food. So this is an easy little trick to quickly create a positive association with Thundershirt for your dog. Next, simply follow the "Fitting Instructions" below. Leave Thundershirt on for 5-10 minutes. Following these simple instructions allows you to learn exactly how to use Thundershirt while the dog is calm and helps to avoid the risk that he or she might begin to associate Thundershirt with an anxiety stimulus. It can also be beneficial to put Thundershirt on every 4-8 weeks in the absence of anxiety. To further strengthen positive associations with Thundershirt, provide a treat to your dog each time right after you put it on. Most Thundershirt pet parents report that their dogs really enjoy wearing their Thundershirts, and many dogs even go on their own to where their Thundershirts are stored when a storm approaches or some other anxiety trigger happens. Place the Thundershirt on your dog's back and wrap the Short Flap under the torso. Wrap the Long Flap under the torso and secure with fasteners onto the Short Flap. You should be able to easily slide your fingers between the Thundershirt and your dog's torso. Wrap the Neck Straps around the front of the dog and secure with fasteners. You should be able to easily slide your fingers under the Neck Straps and should not feel restricting around your dog's neck. If your pet seems nervous or anxious when he or she sees the Thundershirt, try putting it on the ground and giving your dog a little food, using Thundershirt as a plate. This trick often works because many pets become more comfortable with and trusting of anything that they associate with food. 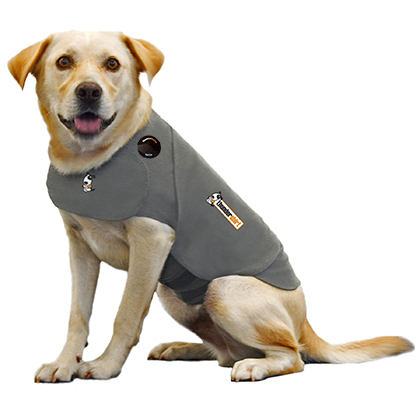 The fasteners make Thundershirt adjustable for many different body shapes. Every size of Thundershirt includes fasteners to adjust to your pet's unique size and shape. While Thundershirt will usually reduce anxieties in dogs just by putting it on, in severe cases of separation anxiety, it is recommended to use Thundershirt in conjunction with a training program. We recommend measuring your pet's chest to ensure you purchase the correct Thundershirt. Please note: Our list of recommended breeds is just a guideline, and in addition, our listed measurements differ from the measurements recommended by the manufacturer. Based on surveys that we conducted, we believe our measurements to be helpful when purchasing a Thundershirt for your dog.